A rare and charming Caughley spoon tray, made at the famous Caughley factory c1785. This delightful spoon tray is beautifully shaped. It has vertically moulded sides to its rim and is of an elongated hexagonal shape. 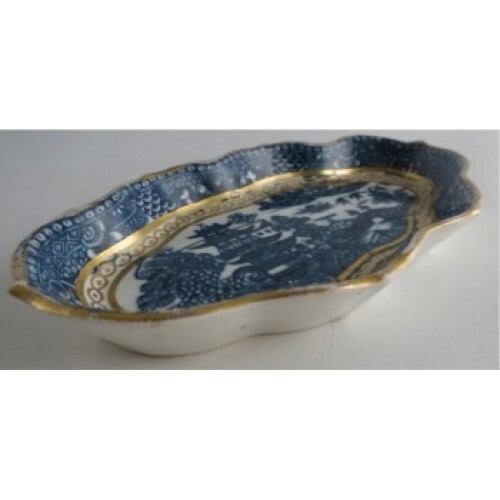 It is beautifully decorated with the blue and white 'Pagoda' pattern and embellished with rich honey coloured decoration. An important part of the eighteenth century tea equipage and tea ceremony, such spoon trays were used to rest the teaspoons on during tea. Only one such spoon tray would be in a complete tea set, so they are quite rare. This beautiful oriental design shows a pagoda in a charming landscape with houses trees, boat and a bridge with two figures crossing it. 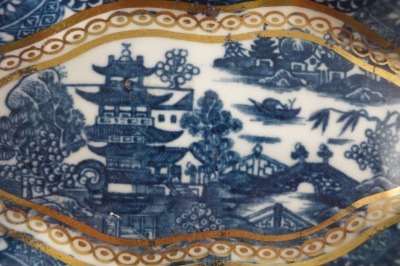 There is a richly decorated blue and white printed border running round the raised rim of the spoon tray. The spoon tray is embellished with rich honey coloured decoration in the form of a band around the base this comprising a chain of gilded ovals with dots in the centre bounded by two gilded lines. The rim of the spoon tray is also gilded. 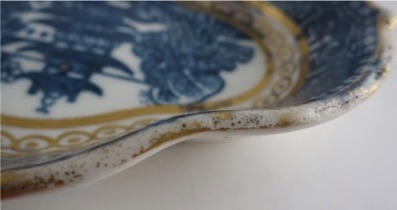 There is the manufacturer's mark of the Caughley factory on the base of the spoon tray. This mark is of the Salopian 'S' mark, this was used at the famous Caughley factory c1775-90. 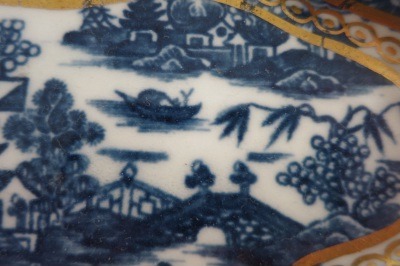 There is the manufacturer's mark of the Caughley factory on the base of the spoon tray. 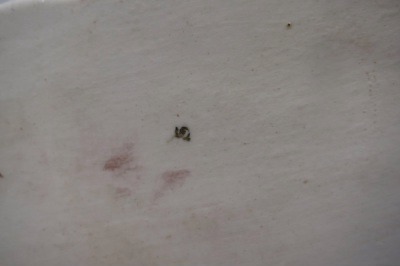 This mark, though faint, is of the Salopian 'S' mark, this used at the famous Caughley factory c1775-90. 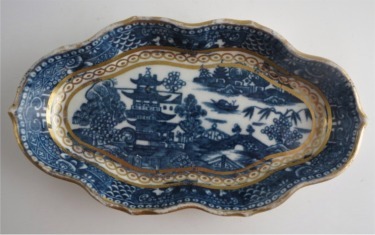 This rare and charmingly decorated 'Pagoda' pattern spoon tray is in excellent condition with no chips, cracks, repairs or restoration. 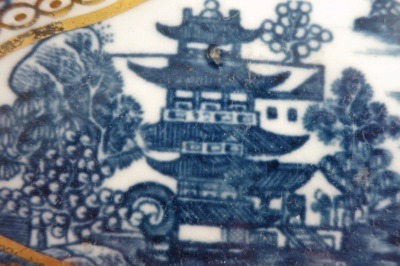 The only minor imperfections is a tiny firing blip in the glaze, this in the roof of the pagoda. It was likely to be a bubble in the glaze which burst leaving this tiny blemish. Also there is some wear to the gilded decoration, particularly to the rim of the spoon tray. 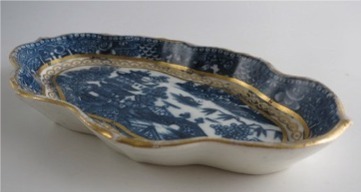 It is certainly a very fine and delightful spoon tray for the collector of Caughley porcelain. An important part of the eighteenth century tea equipage and tea ceremony. Description A rare and charming Caughley spoon tray, made at the famous Caughley factory c1785. 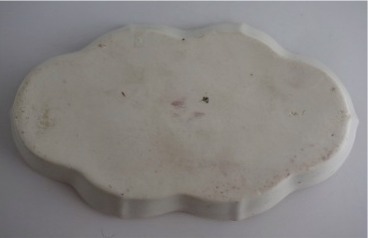 This delightful spoon tray is beautifully shaped. 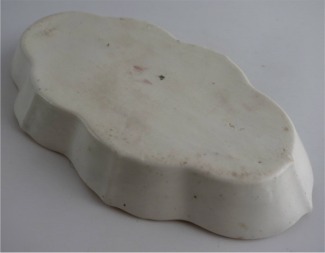 It has vertically moulded sides to its rim and is of an elongated hexagonal shape. 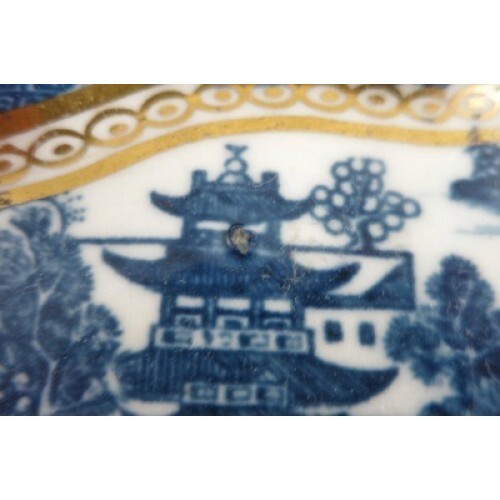 It is beautifully decorated with the blue and white 'Pagoda' pattern and embellished with rich honey coloured decoration. Condition (See main description for full details and pictures) This rare and charmingly decorated 'Pagoda' pattern spoon tray is in excellent condition with no chips, cracks, repairs or restoration. 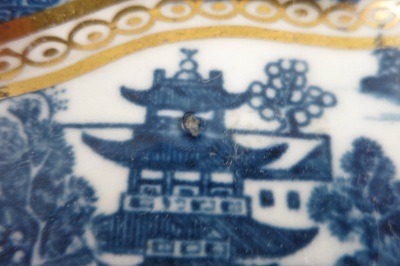 The only minor imperfections is a tiny firing blip in the glaze, this in the roof of the pagoda. It was likely to be a bubble in the glaze which burst leaving this tiny blemish. 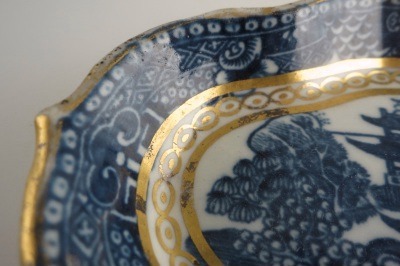 Also there is some wear to the gilded decoration, particularly to the rim of the spoon tray. 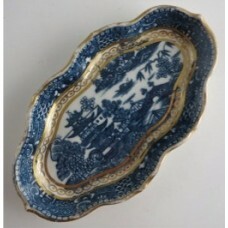 It is certainly a very fine and delightful spoon tray for the collector of Caughley porcelain.